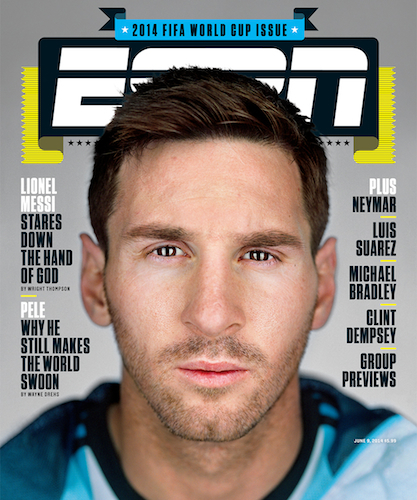 Like any sports publication, ESPN The Magazine often has distinguished cover athletes like LeBron James, Lionel Messi and Serena Williams. But the magazine, like the rest of us, sometimes gets a little jumpy about who’s deserving of attention. 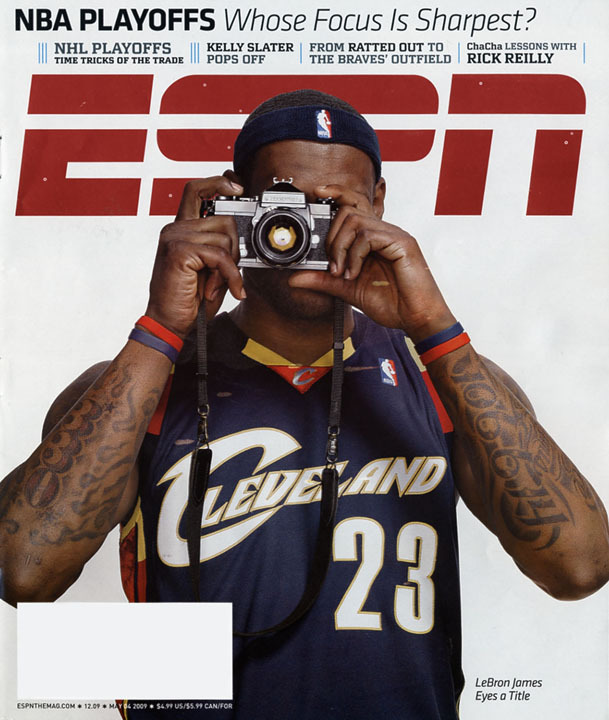 Inevitably, not all ESPN The Magazine covers look wise in retrospect. 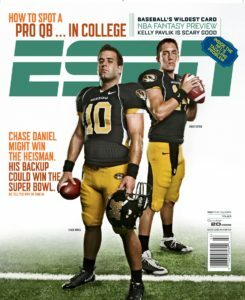 The sports world pays a lot of attention to bad Sports Illustrated covers, but ESPN The Magazine has also had its share of doozys in its 19 years of publication. Here are our 10 favorites. 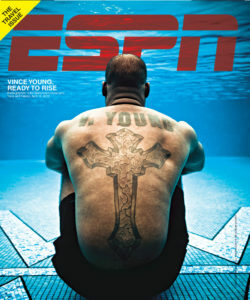 By the time Young appeared on this cover, he had already played four highly uneven NFL seasons, making the idea that he was “ready to rise” seem dubious. 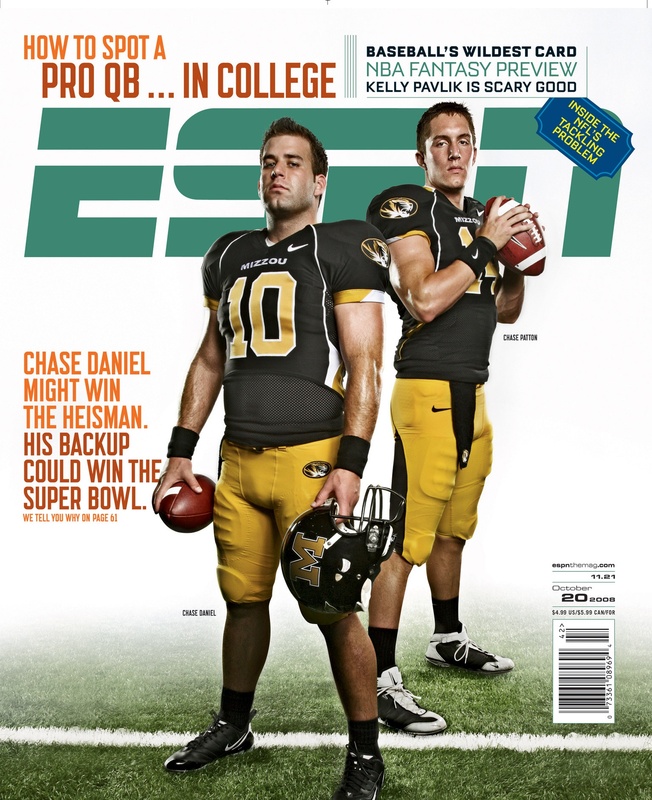 From this cover on, he played in 15 games, went 5-6 as a starter and threw 12 interceptions compared to 14 touchdowns. ESPN’s “NEXT” series has featured a lot of hits (LeBron, Cam Newton, Michael Phelps, Sidney Crosby, Adrian Peterson, etc.) but also some egregious misses (Freddy Adu, Hee-Seop Choi, Rick Ankiel, Michael Beasley, etc.). 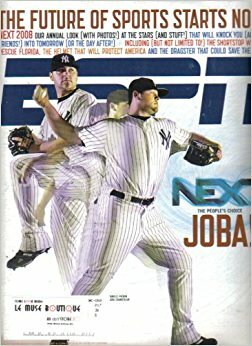 This Joba Chamberlain cover comes from December 2007, when Joba was a rookie hotshot. He’s now out of baseball, with a career ERA of 3.81 and no All-Star appearances on his resume. 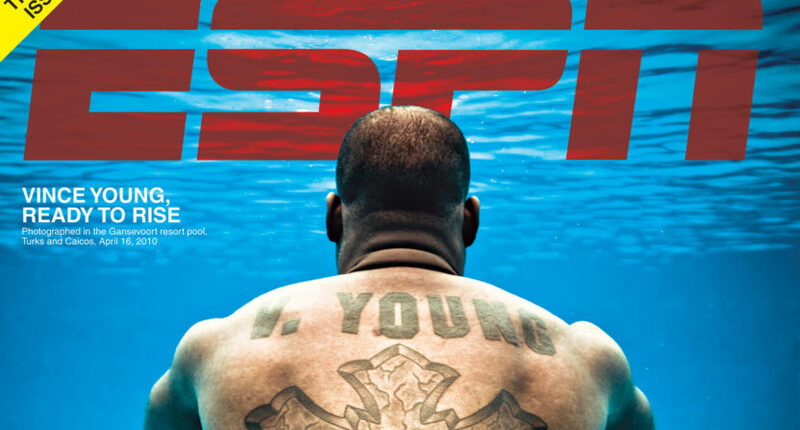 As a rule, ESPN The Magazine seems to shy away from bold proclamations on its covers. (They prefer provocative questions.) 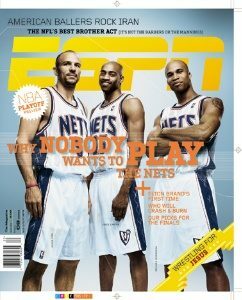 But every once in a while, they’ll run a headline like, “Why nobody wants to play the Nets,” only to watch the Nets lose in five games in the second round of the playoffs, then tumble into a half decade of mediocrity. “Phillips is ready. 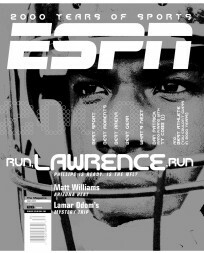 Is the NFL?” read this July 1999 cover, which came in the wake of troubled running back Lawrence Phillips’ big year in NFL Europa. Given that Phillips rushed for a total of 144 NFL yards after this issue was published, it’s safe to say the NFL was pretty ready. NEXT strikes again. After Hideki Matsui’s big rookie season in 2003, Americans apparently thought Japanese All-Stars named Matsui grew on trees. 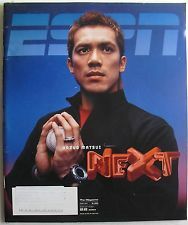 That would explain the hype around Kaz Matsui, who went on to hit .267 with 32 home runs in a disappointing seven-year career. 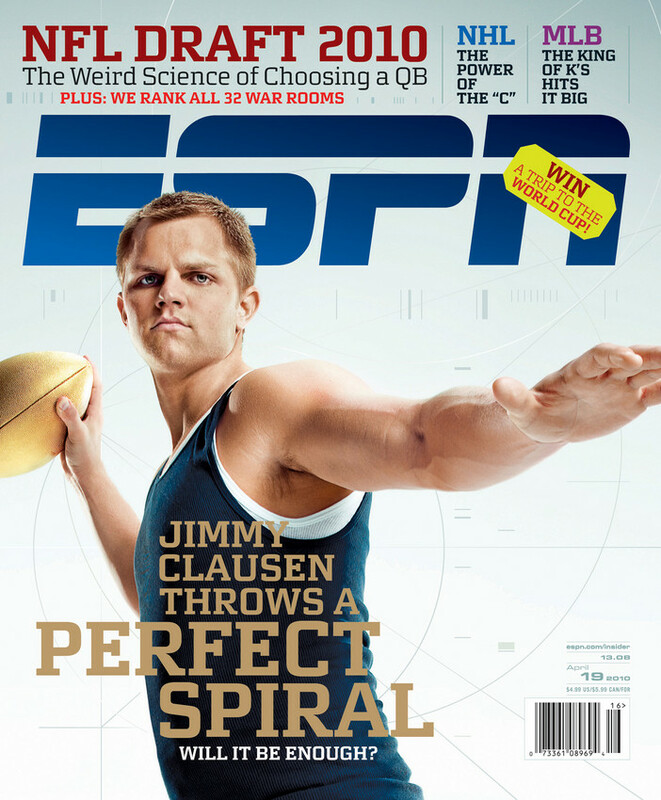 This 2010 ESPN The Magazine cover proclaimed that Jimmy Clausen “throws a perfect spiral.” Whether or not that was true, it didn’t help in the quarterback during a brief NFL career in which he tossed 14 interceptions and only seven touchdowns. “Will it be enough?” the cover asked. The answer, resoundingly, was negative. This one is really just sad. 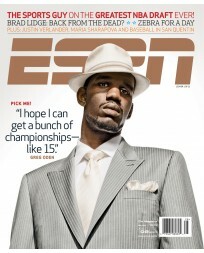 If not for a string of injuries, Greg Oden could have had a legitimately excellent NBA career, and seeing him say—likely somewhat in jest—that he hoped to win 15 championships just makes the whole saga even more depressing. We can’t really fault ESPN for featuring the No. 1 pick in the draft, but this is still one hell of a cold take. 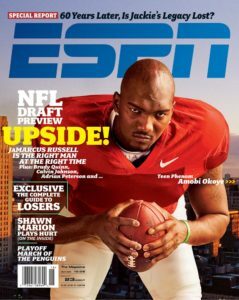 Few takes have ever aged worse than ESPN The Magazine’s declaration that JaMarcus Russell is “the right man at the right time.” Russell, of course, became arguably the biggest bust in NFL Draft history. 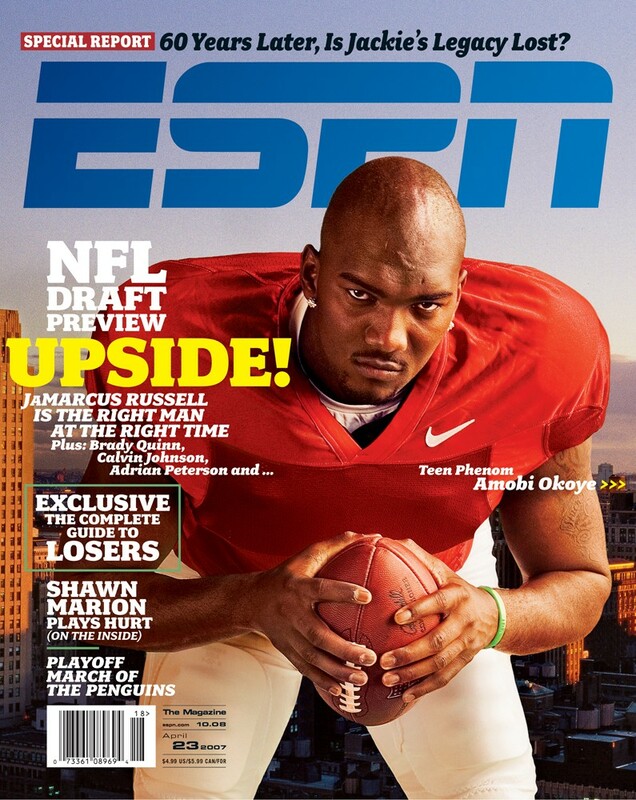 Also, “teen phenom” Amobi Okoye amounted to six seasons and zero Pro Bowls. A lot of fans and media got suckered by the Darko Milicic hype leading up to the 2003 NBA Draft. 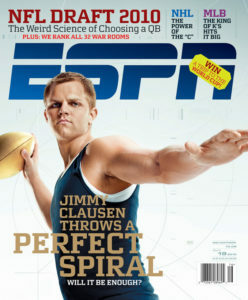 But not everyone endorsed the bust-to-be as enthusiastically as ESPN The Magazine, which declared, “He’s No. 2,” and told us that “You know about LeBron. You need to know about Darko Milicic.” But hey, at least they didn’t say he was better than LeBron.